Ever wondered what would happen if Ben 10 has to battle versus the whole Alien Force? Full of Action, right? As always, we have got another action-packed game for you – Ben 10 vs Alien Force – where Ben single-handedly takes on the Alien force. Will you help Ben 10 against Alien Force? Check out some important things below that will help you! Ben 10 vs Alien Force game is a classic shooting adventure and the chances of winning the game completely depend on the fact that how well you can aim and shoot. With no Omnitrix available, Ben is on his own because he cannot transform into powerful aliens. So, it’s only the laser alien gun you have to use to destroy the Alien Force! Recommended: Play Ben 10 Fighting games online for free now! Before you go to the battleground, you must gear up well. This ben 10 game has multiple levels which keep on getting more difficult and difficult. When you will start playing Ben 10 vs Alien Force online, the first level has a single alien to defeat and it’s just a matter of a single right shot. But as the game progresses, there will be more aliens. Some are flying ones and some are hidden inside chambers where your laser fire can’t reach normally. But don’t worry, Ben 10 also gets some help here. In some of the later levels of Ben 10 vs Alien Force, Ben can use the parachutes to fly and trampoline to jump higher. In this way, it will be somewhat easier to clear the missions. Pro Tip: The laser fire reflects from the walls. You can shoot at angles such that it reaches the aliens. Another thing to mention about this ben 10 game is that you can play this game without using any keys. All it takes is the mouse to aim and click to shoot. So, that’s all about Ben 10 vs Alien Force game. Get set to kill the fierce Alien Force and win this game. With Laser Gun, aim and shoot the Alien Force and win all the levels! Good Luck!! 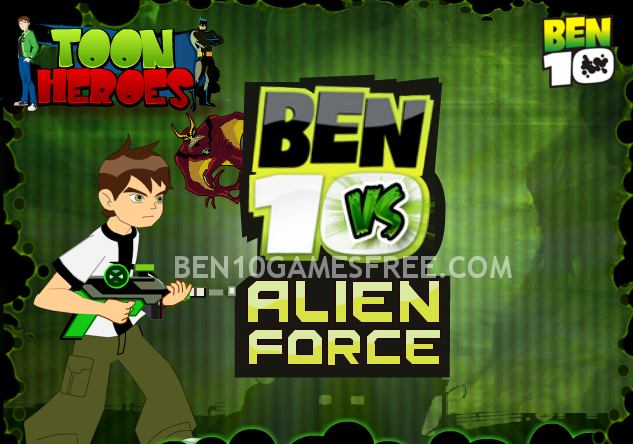 Don’t Forget to give your rating for Ben 10 vs Alien Force game and share your tips and tricks to win this game in the comments section below.